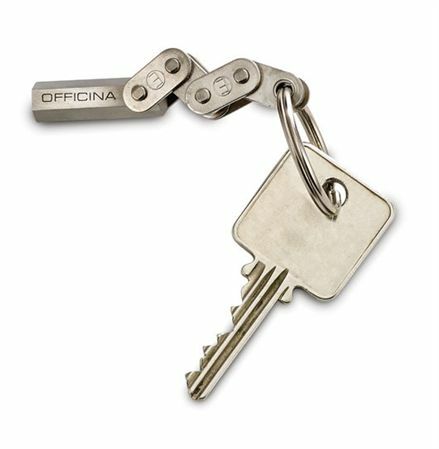 Order your Giuliano Mazzuoli Officina Key Chain today from FahrneysPens.com. Fine Pens, Refills & Luxurious Gifts – great prices & fast shipping. Giuliano Mazzuoli extends its Officina line by introducing three unique gift accessories. The cutting-edge design of its Officina writing instruments are based on tools used in Mr. Mazzuoli’s grandfather’s bicycle workshop. The "Bicycle Chain" key chain maintains this creative interpretation of industrial objects and is crafted in Italy of solid metal, using the highest standards of manufacturing. The chain holds an Allen wrench for mechanical repairs on the go! The line also includes a pair of “Nuts & Bolts” cufflinks and a Money Clip. Each piece comes in an Officina gift box with an image of the old Italian bicycle workshop on the front.